2010 ਸੈਨ ਡਿਏਗੋ ਕਾਮਿਕ-ਕਾਨ ਇੰਟਰਨੈਸ਼ਨਲ 'ਤੇ ਕੇਵਿਨ ਫੇਗੀਜ, ਜੋ ਜੋ ਜਾਨਸਟਨ, ਕ੍ਰਿਸ ਇਵਨਸ ਅਤੇ ਹੂਗੋ ਵੇਵਿੰਗ. ↑ Ryan, Mike (May 19, 2010). "Should We Now Call Him 'Captain England'?". Yahoo!. Archived from the original on July 2, 2011. Retrieved June 28, 2010. ↑ Yamato, Jen (April 30, 2012). "Marvel's Kevin Feige on Avengers, Iron Man 3, Thor 2, Universe-Building, and Elektra". MovieLine. Retrieved May 3, 2012. But as we were working on them we started to keep track of some things that the writers and filmmakers of one movie were doing anyway and we started to track them and realized that we could utilize those later down the line. That's how the Cosmic Cube came about; what started as a little seed would grow and grow and grow to The Avengers. ↑ Graser, Marc (March 22, 2010). "Chris Evans to play 'Captain America'". Variety. Archived from the original on April 25, 2011. Retrieved March 23, 2010. ↑ Jensen, Jeff (October 28, 2010). "This week's cover: An exclusive first look at Captain America: The First Avenger". Entertainment Weekly. Archived from the original on July 4, 2011. Retrieved October 28, 2010. ↑ Keyes, Rob (April 5, 2010). "Chris Evans Talks Captain America". ScreenRant.com. Archived from the original on July 4, 2011. Retrieved July 9, 2010. ↑ Mortimer, Ben (June 24, 2011). "Captain America: The First Avenger Set Visit!". Superhero Hype!. p. 3. Archived from the original on July 4, 2011. Retrieved June 27, 2011. ↑ Bently, David (May 27, 2010). "Hayley Atwell talks Captain America, confirms Tommy Lee Jones in cast". Coventry Telegraph. Archived from the original on July 4, 2011. Retrieved July 9, 2010. ↑ Green, Graeme (November 15, 2010). "Hayley Atwell on Any Human Heart and flirting with Captain America". Scotland Herald. Archived from the original on July 4, 2011. Retrieved November 15, 2010. ↑ "Hayley Atwell's machine gun fun". The Belfast Telegraph. May 18, 2011. Archived from the original on July 5, 2011. Retrieved May 20, 2011. ↑ Graser, Marc (March 22, 2010). "Chris Evans to play 'Captain America'". Variety. Archived from the original on December 18, 2010. Retrieved March 23, 2010. ↑ Hugo Weaving confirmed as Red Skull in Captain America. Marvel Studios. May 4, 2010. http://www.comingsoon.net/news/movienews.php?id=65732. Retrieved on 4 ਮਈ 2010. ↑ "Comic-Con 2010: 'Captain America'". Entertainment Weekly. Archived from the original on July 4, 2011. Retrieved March 23, 2010. 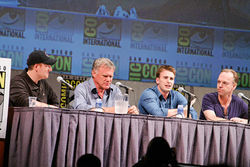 ↑ "MARVEL-OUS STAR WATTAGE: Actors Assemble For Comic-Con Panel Including 'The Avengers', 'Captain America', & 'Thor'". Deadline Hollywood. July 24, 2010. Archived from the original on July 5, 2011. Retrieved July 25, 2010. ↑ Mortimer, Ben (June 24, 2011). "Captain America: The First Avenger Set Visit!". Superhero Hype!. Archived from the original on June 28, 2011. Retrieved June 24, 2011. ↑ Bruno, Mike (April 2, 2010). "'Captain America': Sebastian Stan cast as Bucky Barnes". Entertainment Weekly. Archived from the original on July 5, 2011. Retrieved October 27, 2010. ↑ Ditzian, Eric (January 12, 2011). "Sebastian Stan Talks 'Captain America' Casting And His Year Ahead". MTV News. Archived from the original on July 5, 2011. Retrieved January 12, 2011. ↑ "Captain America Movie: Col. Phillips Cast". Marvel Comics. June 28, 2010. Archived from the original on July 5, 2011. Retrieved June 28, 2010. ↑ Flaherty, Mike (February 11, 2011). "Tommy Lee Jones Tolerates Us for a Talk on HBO's Sunset Limited, Men in Black 3, and Captain America". New York. Archived from the original on July 2, 2011. Retrieved February 11, 2011. ↑ Marshall, Rick (May 4, 2010). "Tony Stark's Father Will Have A Role In 'Captain America,' Says Jon Favreau". MTV Splash Page. Archived from the original on July 4, 2011. Retrieved June 30, 2010. ↑ Fischer, Russ (May 24, 2010). "Dominic Cooper Says He's Howard Stark in Captain America". /Film. Archived from the original on July 4, 2011. Retrieved June 30, 2010. ↑ "Captain America: The First Avenger – Dominic Cooper on Playning Howard Stark". IGN. October 6, 2010. Archived from the original on July 4, 2011. Retrieved October 7, 2010. ↑ Wigler, Josh (June 7, 2010). "Neal McDonough Confirms 'Captain America' Role (And Bowler Hat), Talks Howling Commandos". MTV News. Archived from the original on July 4, 2011. Retrieved July 9, 2010. ↑ Morales, Wilson (June 9, 2011). "Derek Luke Talks HawthoRNe, Captain America". Blackfilm.com. Archived from the original on July 4, 2011. Retrieved June 23, 2011. ↑ McNary, Dave (June 7, 2010). "Stanley Tucci joins Captain America". Variety. Archived from the original on July 21, 2011. Retrieved March 23, 2011. ↑ Clark, Kyrstal (August 29, 2010). "Stanley Tucci Says Captain America Has a Very Good Script". ScreenCrave.com. Archived from the original on July 4, 2011. Retrieved August 29, 2010. ↑ Coratelli, Carlo (May 7, 2011). "Intervista a Kenneth Choi – Jim Morita in "Captain America: The First Avenger"". ComicUS.it. Archived from the original on July 5, 2011. Retrieved May 29, 2011. . Scroll down to English translation. ↑ "JJ Feild's heavy burden for film". The Belfast Telegraph. May 10, 2011. Archived from the original on July 5, 2011. Retrieved June 23, 2011. ↑ "Toby Jones to Play Arnim Zola in Captain America". ComingSoon. May 7, 2010. Archived from the original on May 10, 2010. Retrieved March 23, 2011. ↑ Jensen, Jeff. "An Exclusive First Look at 'Captain America: The First Avengerਫਰਮਾ:Single double, Entertainment Weekly, November 5, 2010. Time Warner. ↑ Goldberg, Lesley (June 23, 2011). "'Game of Thrones': 'Tudors' Actress Natalie Dormer Joins Cast". The Hollywood Reporter. Archived from the original on April 1, 2014. Retrieved April 1, 2014.